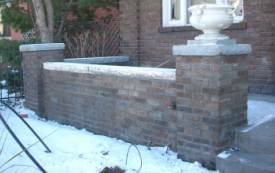 Tuckpointing is simply the process of repairing the mortar on a brick, block or stone building. Why does the mortar decay or crack? Prior to the 1940s most of the mortar in the Denver area was made mostly from lime and sand. Portland cement was not as available and thus the mortar is very soft. Usually you can rub a mortar joint with a finger and sand will come off of it. This soft mortar is able to be washed out by lawn sprinklers hitting the house or by leaking roof gutters and downspouts. The settling of the house will cause cracks in the mortar. Moisture from various sources will sit in these cracks and then in the winter it will freeze and thaw. This freeze-thaw cycle will cause the cracks to widen and the bricks will loosen and begin to move. Chimneys and porches are less protected and thus will decay faster than the rest of the house. What is the solution to cracked and decayed mortar? 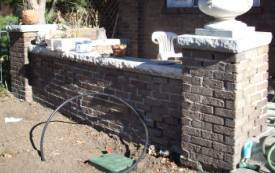 The first thing necessary is to adequately prepare the surface to be repaired so that the new mortar bonds properly to the brick. Next it is vital that the new mortar be a similar type as the old mortar. If you use a hard modern mortar it can be harder than the old soft bricks and as the house moves (due to the ground contracting and expanding) it can ruin the brick. We make our own mortar from lime and sand that is very close to the original mortar. These old homes usually had a very white mortar when they were new. However, after a hundred years of pollution and being baked in the sun the mortar isn’t white and yet it isn’t gray either. Some homes have a mortar that was originally very black but has been bleached white by the sun. Houses made in the 1890s often have a red mortar color. We have become very good at combining available materials to match the current color of the mortar so that the repaired area looks as good as possible and blends in with the rest of the house. We work in such a way that we don’t create smears of mortar on the brick faces themselves. We try to avoid chemicals if possible because they could harm the brick or the environment. Often times, if we need a cleaning agent we will only use vinegar and water. When we’re done with a job we’re careful to clean up after ourselves and not leave a mess. We expect the tuckpointing work that we do to last for a good number of years – but because of environmental factors such as leaking gutters and misdirected sprinklers we cannot give a blanket warranty. However, if a job we did does not last a reasonable length of time we will repair it at our expense. We also don’t expect anyone to pay for a poorly done job. If we honestly cannot satisfy a customer or do a job right, we will not charge for it. Call Chimney Jack today for a free brick & mortar repair estimate!